Speed Up Your Post and Live Product Workflow! We designed our Easy Key fabric to be anti-reflective, wrinkle-resistant and washable. Here's how that's going to save you time. Green spill is that less-than-wonderful, green tinge you may see on your talent. It happens when your lighting hits a green screen and reflects back onto your talent. It can be difficult and time-consuming (sometimes taking hours) to remove. Being anti-reflective means the Portable Green Screen will have less green spill. This alone can save you hours of work! Wrinkle-resistant means less shades of green cast from the shadows those wrinkles cause. The fewer shades of green, the less time you spend editing them out in your software during or after the production. The Portable Green Screen is wrinkle-resistant, saving you time you might otherwise have to spend on keying out multiple shades of green. Dirt spots take time to find and edit out. A quick wash from time to time removes them so you won't have to... saving you even more time! Many other green screens can take quite a while to set up - setting them up, steaming out the wrinkles, and moving them around. With the Acro Portable Green Screen can be set up in a minute or two. With less steaming, take off another 20 minutes or more from your set up time! Of course, it's Ultra-Portable! Weighing in at about 5 pounds and small enough to fit in a part of your suitcase. It's easy to store away too. Satisfaction guaranteed or return for a full refund. Includes a one-year guarantee against manufacturing defects, through Acro Products. Simply click on the ""Add to Cart"" Button to order yours now while supplies last. Stocks are limited. SAVE TIME IN POST-PRODUCTION EDITING. Our Easy-Key fabric is wrinkle-resistant, anti-reflective and washable. Spend less time editing out wrinkles, hotspots and dirt spots in post giving your production that professional look. SAVE TIME SETTING UP. The Portable Green Screen is almost 4 times faster to set up than a conventional backdrop. It's also wrinkle-resistant so you'll spend a lot less time steaming out wrinkles, too! EASY TO TAKE WITH YOU ANYWHERE. The Portable Green Screen is ultra-portable so it's easy to take anywhere. To make this frame ultra-portable, it is designed to lean against a wall or a a spare light stand (not included). PERFECT FOR THE STUDIO, HOME OR OFFICE. At at about 7'10" high, it sets up nicely under 8 foot ceilings. 100% MONEY-BACK 90 DAY GUARANTEE. 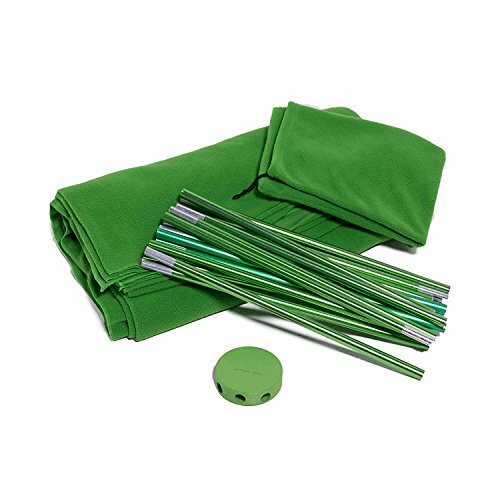 We know you will love the Portable Green Screen but should there be any problem with the product, we will cheerfully send a replacement or provide a full refund - which ever you prefer. If you have any questions about this product by ACRO, contact us by completing and submitting the form below. If you are looking for a specif part number, please include it with your message.